« Happy New Year……at little late! Looked out the front door this morning and my car had white stuff on it! Drove to work in it and it stayed around until around noon today. Looking at the railing coming up the stairs to the shop, it looks like we got at least 2 inches. Hopefully, this is it! Unfortunately, I am seeing a 60% chance of snow in the forecast for tomorrow. Tuesday is partly sunny but the temperatures don’t look like they will get out of the teens. Shiver! Good news on the horizon. By Thursday, I am seeing sunshine in the forecast and mid 40s. Friday looks low 50s with 60 forecast for Saturday. Sunday and the following week we are bouncing around in the mid 40s, upper 40s and some low 50s. I’m ready! The past three days have seen generation in the morning with at least two units or more, then lower generation of not quite a full one. Monday and Tuesday look like more of the same. Wednesday Jim knows how to start his New Year off right. As he was walking to Gina’s car last Wednesday he was saying, “I know how to pick a good day for fishing” and he did. Temperatures were in the 60s, some wind, but not what they had predicted, and the generators were off! Plus the fish were biting. Good day for Jim. The morning started out a little slow, but he caught several fish on something red, mainly the ruby 2. After lunch, they started stripping. First it was the JQ, then the holographic green crackleback in a size 16 and finished up the day with the Tiger Tail. 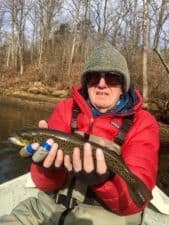 This entry was posted on Sunday, January 14th, 2018 at 3:03 pm	and is filed under Fishing Reports. You can follow any responses to this entry through the RSS 2.0 feed. You can leave a response, or trackback from your own site.